At the time a lot of riders today are not aware of the potential importance of a well adapted saddle for the horse. They tend to make their choice in order to have a perfect fit. It's an excuse, but the most important is the back of your horse that it should be spared and protected. 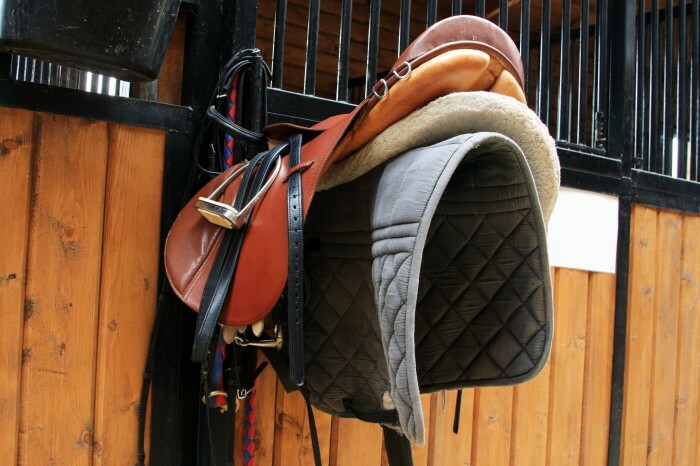 A good saddle must be adapted to the horse and his rider, and be of good quality (even fine used saddles). Warning! A saddle of very good quality, if it is absolutely not suited to your physical horse hurt it for sure. And custom saddles? This is fine, but beware, a horse changes morphologically throughout his life (musculature, loss of condition, growth ...). What is an unsuitable saddle? - The pommel of the saddle rises: too narrow saddle, the seat tilts backwards. - The cantle of the saddle rises: too wide. (Experience, press the pommel of the saddle to check this, and once in the saddle, we can see that the saddle rises at the back sitting trot, or canter for example.) It is also possible that the padding are just not in contact during the strapping. - Difference saddle - withers. No finger or a finger can be passed between the withers and the saddle: the tourniquet is compressed. Very very bad! A hand or more than 4 fingers can be passed between the withers and the saddle: the saddle is narrow. - The panels of the saddle are not in contact. - Narrow gutter: the column is not clear. - The length of the saddle: beyond the kidneys. - An abnormal wear of the hair. - Irregular sweat zone after work. - White hairs which indicate a compression of the saddle - deficit irrigation. - Withers Injury, or others.